So, I had a weird idea. 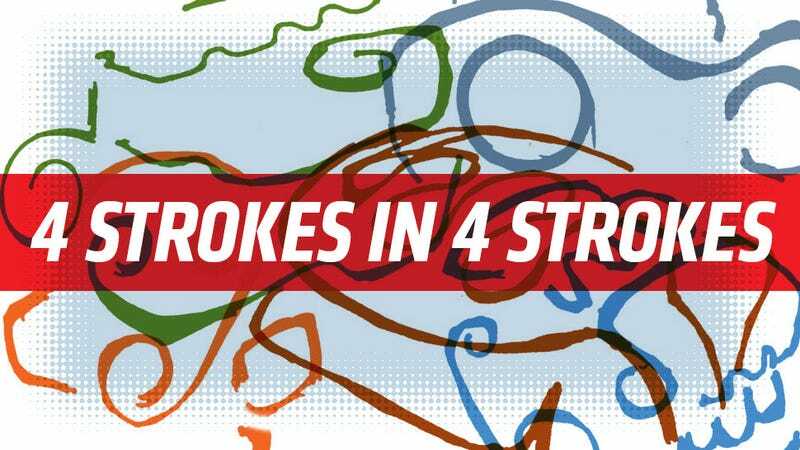 And, like with pretty much every weird idea I have that’s not too obscene and sort of automotive-related, I’m sharing it with you: what if I drew four-stroke car engines using only four strokes? Well, we needn’t wonder any more, because I tried it. I picked four well-known four-stroke car engines and, yes, drew them in four simple strokes. I tried to keep the strokes not too long and not too complex – think gestural strokes, not an attempt at a contour drawing. Sort of calligraphic. To have some very, very mild fun with this, want to see if you can guess what engine I was trying to draw? Of course you do. Let me know your guesses in the comments and I’ll confirm the answers at midnight, EST, if I manage to remember. Or tomorrow. Eventually. Winner gets a lingering, creepy hug from the Jalop of their choice, location permitting!